Rats can reproduce if you don’t take action in eliminating them and leaving them unchecked. So while they’re still young and few in numbers try to exterminate them as early as possible. But before you do that, there are things that you need to consider before buying the best rat poison. When you start to notice the increase of rats in your home, the best thing to do is to act fast. You might not know the existence of many other rats roaming in your home. The best option for you might be to set up traps. But there are rats out there that are downright smart that evade most traps that you put out. Your next option would be to hire an exterminator. But this method could cost you a lot of money, so let’s pass on this option and reserve it as a last resort. Your next best option would be to buy rat poison and do the job yourself. Usually, rat poison would do the trick as it’s one of the most effective ways to eliminate these pests. Each rat poison has its own unique way of exterminating these rats. Some might knock them out, while others would instantly kill them. To help you decide what rat poison that you’ll use, here are the things that you might want to consider. Before spraying those chemicals, there are a lot of things that you might want to consider. You need to consider the fact that what you’re spraying isn’t an ordinary liquid. This liquid can be both harmful to you and the animals around you. Consider the urgency, the type of rat poison, and the place where you’ll be releasing the poison. Do you need to resort to poison? Is there a need to use it now? These are questions that you need to ask yourself before spraying this pesticide. If you have other solutions besides using rat poison then go for it. There’s no need to rush in and use poison to solve your rat problems. Sometimes rat traps are enough to finish the job, they pose no danger to your health and surroundings. Always check if there are other alternatives to your rat problem. If there are other ways besides using rat poison, then use that method. There are different types of rat poison in the market that have various effects. Some formulas have negative side effects to the human body. Some might even affect your pets. Rat poison is not only dangerous to rats, but also to humans. That’s why a certain degree of care must be observed when using rat poison. Take your time when hiding the rat poison so that your children and pets will be out of harm’s way. And remember; always wear protective clothing when distributing rat poison. All these rat poisons is lethal, that’s why you’ll need to consider the place where to release it. Remember to use only what’s enough and never exceed what is required. Rat poisons contain Rodenticides that are toxic to rodents as well as in humans. This element prevents the blood to clot. Thus causing uncontrollable bleeding which causes the deaths of the rodents. First effect – Rat poison that contains only Rodenticides produces the following effect. After the poison enters the rat’s body it kills it slowly after several days. To fully realize this, you must constantly feed the rats with the poison. Most rat poison that’s being sold in the market falls into this group. The effects of this kind of poison affect the rat over time that’s why they don’t die immediately. Second effect – Rat poison which contains bromadiolone and brodifacoum have a strong effect. Which is why feeding the rat once is enough to kill it. Rats that eat this kind of poison will only last for a couple of hours. Use this kind of poison when there is an outbreak of rats in your home. Make sure your pets are secured when you feed rats and keep it away from children. Using rat poison is the fastest and effective way to exterminate rodents. This method is cheaper compared to using traps. This is because you’ll only need a pack of poison to get the job done. You don’t need to buy lots of trap to kill the rodents. Rat poison is also beneficial to use in wide areas such as fields and sheds. No pet is safe from poisons. Like any other poison, rat poison is equally dangerous to your pets as it is to rodents. Beware; your pets might swallow such poison which could lead to your pet’s death. In order for your pets to avoid eating it, place it in areas which are hard for them to reach. Place it inside rat holes so that they wouldn’t see it. Or better yet, place your pets in secure places like cages for the time being. Until your rat problem persists don’t let them out unattended. Always remember, when the poison kills the rat, you’ll have to collect its dead body. This is the tricky part when using poisons; you don’t know where the body will end up. This wouldn’t be a problem to you because the body will emit a bad odor for you to find. Now that you know what to consider before buying a rat poison, here are some products that might help you decide. We’ve reviewed some of the best rat poisons that are available in the market today. The Havoc rat and mouse bait is a very toxic poison. Extra care should be observed when handling this product because it can be deadly to you. What makes this product stand out from the rest is that the level of poison is high. The poison comes in a form of granules that when consumed will kill the rat gradually. Keep this product out of reach of children and pets. The granules might come in contact with your children. The havoc rat and mouse bait work well inside of the house. Though it can be used outdoors. It is strongly suggested that you place the poison indoors for better effect. One feeding will kill many rats in one day. Ready to use and no mixing required. Can also be used to kill cockroaches and other rodents. Hazardous to pets and children. Mice might not eat or ignore the bait. 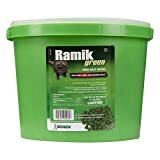 The Ramik rat bait pail Neogen rodenticide is the rat poison you need if you have a rat infestation. Its quick and easy use will make killing these rats a breeze. You can use this poison in any weather condition. The poison could kill the rats and mice whether they are indoors or outdoors. You wouldn’t have to worry about the rats ignoring this poison because it is fish flavored. The flavor and high protein are irresistible to any rodent that may pass by it. The packaging of the product is another thing to look forward to. This is because it’s packed separately in min bait packs. Like any poison, your diligence in handling this product is required. Can be used in any weather condition. Highly effective against hordes of mice. Packed separately in mini bait packs. Poisonous to pets and children. Some rats might ignore the poison. 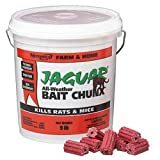 The Motomco Jaguar rat bait work great against field and house mice. What makes this product stand out is that the poison is made in the shape of blocks. This makes for easy placement of the poison around the house. Another noteworthy feature of this product is that it comes in two colors. Each color having different ingredients mixed in. The red and green blocks are mixed with different doses of poison for you to choose from. Beware of using this poison because like the other brands on this list it is also highly poisonous. Handle it with care and keep it out of reach of children. This is because the blocked shape poison could be mistaken for a child as a toy. And also keep it in hard to reach places for your pets. Comes in the shape of blocks. Easy for rats to detect and consume. One feeling can solve your problems with mice. Can be used for exterminating other rodents. Rats might ignore the blocks. Can be easily mistaken as a toy by kids. The Tomcat Rat and Mouse Bait Pellet might be the one you’re looking for. 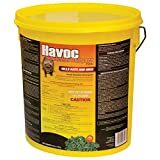 If you want a traditional and simple rat poison that’s effective in eliminating rodents. It’s simple as placing the poison in an infested area and wait for the dead bodies to smell. Always remember to seal the lid of the bucket to prevent the poison from spilling. What makes this product stand out from the rest is that rats are attracted to it. You wouldn’t have a problem feeding it to the rats because rats love this poison. This rat poison can take out a heavy rat infestation in just a matter of days. With its high-density poison, no rat can survive when they take a bite out of this poison. Always remember to handle this poison with care and keep it out of reach of children. And especially your pets, because they tend to eat anything that’s lying on the ground. Comes in pellet form for easy feeding. One feeding can kill many rats. Rats can’t resist eating it. Highly toxic for kids and pets. Dead rat bodies are hard to find. The Old Cobblers Farnam might be what you’re looking for if you prefer your poison in blocks. This rat poison can really do the trick because the block can be easily consumed by the rats. This poison can easily substitute traps that are hard to set up. As its name suggests, One bite is really a one bite poison for rats. Just place the block where the rats usually pass and they’ll eventually consume it. The contents of this poison are also high as compared to other products. But, the only difference is that this product comes in a form of a block. Handle this poison with care. This is because the poison might get through you if you’re not properly equipped. Use gloves when handling the blocks so that it will not come contact with your skin. One bite out of the block will secure a kill. Lower price compared to other rat poison. Can be used to feed other rodents. Hard to place because of the shape. Rats might ignore this bait because of the shape. Highly toxic to humans and pets. There are different kinds of rat poison in the market, each having their own unique brand. But for us, the clear winner among this list is the Tomcat Rat And Mouse Bait Pellet. Going back to the characteristics of the best rat poison. 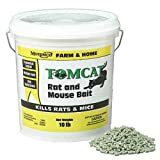 The Tomcat Rat And Mouse Bait Pellet fit the category well. It’s convenient to use and rats love eating this poison. One of the biggest problems of rat poisons is that rats tend to ignore the bait. But that’s not the case of this poison. For some reason, rats love to eat this poison which is great for eliminating them. In the end, choose the one that suits your needs, you don’t have to quick to decide. 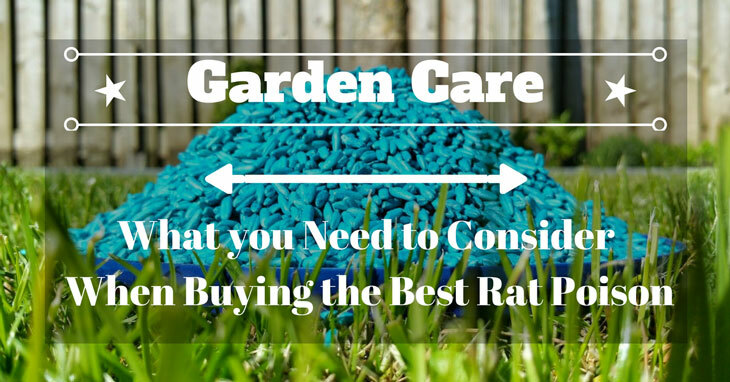 Using rat poison is something to think about before buying. This is because it has consequences.